This demonstration is based on this Free Pascal Wiki page but does not use the "very odd" typed constants in the original. To keep it simple, we have not implemented the LoadFromFile or SaveToFile routines of a memo, but you can paste the text to be searched into the top memo. You can also select text in the bottom memo and then copy and paste it into a document to save a log of your searches. 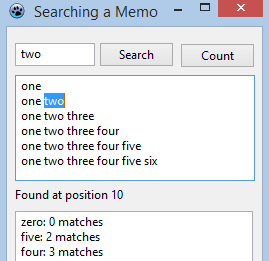 The following page shows you how to search selected text in a RichMemo (which you need to install in Lazarus).